They didn't ask for fame. They were born with it. For the first time, readers will meet Emma Conway, daughter of a powerful New York State Senator. Joanna Philbin has established herself as a writer of fun, cheerful young adult novels. 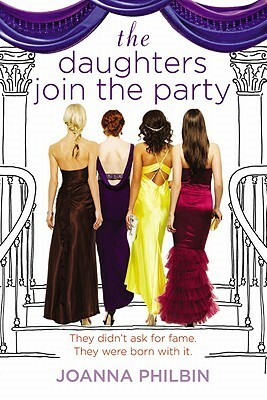 The Daughters series features the daughters of four rich and famous families. Unlike most series of rich kids, these characters are "good girls." They each have their flaws and lessons to learn, but by the end of each book, the girls make the right choices and are happy. Each book in the series is told from the point of view of a different girl. A new girl joins the trio that we met in the first three Daughters series. Emma has just been kicked out of boarding school and is now going to the same New York City private school that Lizzie, Hudson, and Carina attend. The spotlight is on Emma, because her father is running for president. Emma definitely has the most outrageous personality of the four girls. Since her older brother Remington is Mister Perfect, Emma distinguished herself by being rebellious. She always speaks her mind, regardless of the occasion or audience. Ostensibly, she doesn't care about what people think of her, but I think she wants to be seen as an edgy bad girl. Emma's personality is nothing like mine or any of the people I was friends with growing up, but I really liked her. I wish I'd had the courage to speak up for myself like she does. And since we read from her point of view, we realize that Emma has good intentions and really is a nice person. Emma quickly gets in over her head in this book. She makes a stupid comment - accidentally - to the media about her father's candidacy and gets lots of attention. She continues to say things on the stump that no candidate or candidate's child has ever dared and the public loves her. So she goes out on the road to campaign for her dad. But politics is not the best realm for a young teenager and Emma has a lot to learn. While Emma was a fun character because you never knew what she was going to say next, I do think this was the least realistic Daughters book yet. No presidential candidate in his right mind would have his 15 year old daughter making big time campaign speeches. Or if he did, I would lose all respect for him. Even if a candidate's child did go on the stump, I can't imagine said child getting away with the things Emma says. It's great entertainment, but I can't imagine it happening. Regardless of its realism, The Daughters Join the Party was just as fun as the previous books (although Lizzie and the first book is my favorite). The Daughters series is rather formulaic. You know what you're going to get. But that's not a bad thing. When I'm choosing where to go out to eat, I have loads of restaurants to go to. I usually end up going to my favorite place and getting my favorite dish. I'm never surprised but I always leave happy. You'll leave happy with any book in the Daughters series. I always mean to read this series but just haven't gotten around to it yet. With all of the campaigning that's happening in real life right now, this sounds like a fun choice. Thanks for the reminder! I've been eyeing these for a bit now. I think you've finally given me the courage to buy them. This sounds like a fun series I've been noticing them for a few weeks since i saw this on Netgalley and since then I've seen great things about it! Wonderful review! I remember your past reviews of this series Alison and they just sound like fun books:) I can't imagine having to live in the public eye and having to monitor what I say. My mouth would get me in a lot of trouble really quickly I think! I kind of like predictability in a series, especially one like this (though I haven't read it). There's something satisfying about returning to a familiar place with familiar characters. I think I might have to check this series out. Thanks! Still have not picked up this series. It looks like for me it will be a fun and quick read. Ah yes! You can never go wrong with comfort food! It always makes me happy too!